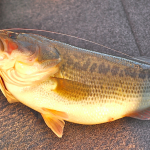 Our staff was able to secure one of Japan’s rare ROMANMADE swimbaits. These high dollar swimmers are one of Japan’s noted big fish catchers. We heard much about their versatile swim-actions and time intensive manufacturing- which always attracts the JDM anglers. Aiming for any record is difficult. You would be amazed at the relentless hours trophy hunters dedicate to their once-in-a-lifetime shot. Believe us… it’s mostly a thankless, non-eventful journey. Five, ten, or twenty years of doing the right thing can lead to many big fish but no record. In most cases, trophy hunters are their own fans. They don’t have tournament fringe benefits like calling a buddy for GPS hot spots or summoning a local guide prior to a tourney, or standing on stage displaying a 20-pound stringer. Not even five fish- thirty pounds will get them in the record books. Record chasing is a solo game. Although, big swimbaits may not be for everyone (requiring endurance to throw all day), when the opportunity presents itself these baits can pull the most elusive fish from the system. 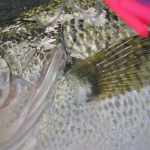 In the last several years more tourney-goers have created their own “care-set” of big swimbaits for when those unique big fish opportunities present themselves. “Tour pros have caught on…figuring if trophy hunters have increased their opportunities …so could they. A clear example is in California where they have club tournaments or small night tourneys where it takes 60 pounds (5 fish limit) to win,” says JDM importer, Pete Sagartz. 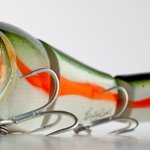 “ROMANMADE makes several swimbaits ranging from 7 inches to nearly12 inches. Their biggie is called the Mother. Next in line is the Negotiator Series and Trick series (several models each) as well as a blue gill bait called the South,” purports Mr. Sagartz. BassEast.com decided to see how ROMANMADE’s Trick Lipless would handle our “chuck and wind” session. Dimensions: Weighing in at 75 grams (2.6 ounces) the 7.2-inch Trick is in ROMANMADE’s light heavy weight division. Casting: The Trick was a dream to cast. Remember it’s a 7-inch solid wood bait. We expected cumbersome casting. On the contrary it was easy to toss distances or in tight places, mating well on a regular flippin stick. 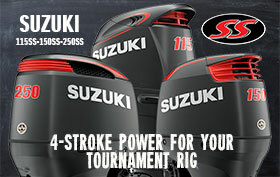 This is nice for those guys that don’t have a specialty swimbait rod. Retrieval: The Trick was fluid, balanced, and pushed a lot of water. “Stop-n-Go” retrieves were easy. Long retrieves were not laborious and the bait didn’t hunt or roll. “Ripping” didn’t foul the bait. Hooks didn’t catch. Mind Blowing Movement: Unlike many swimbaits that sink, (once the retrieve is stopped their action dies or the bait collapses) the Trick glided. Fishing in 15 feet of water, we watched the bait nearly swim off, staying upright. Heck we’ve paid $30.00 for a ½ oz. custom-made, hand painted crankbait that didn’t do that. 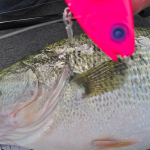 In fact, we have fished ABS plastic swimbaits with balancers that don’t come close to this swim action. Appearance: The Trick looks cool. We did question some of the color patterns, as we’ve never seen these schemes before. The colors are nontraditional but refreshing. BassEast.com gives this bait an A + in action, a B+ in paint scheme and an A in construction. For more on ROMANMADE go to www.romanmade.com or call (630)-666-2882.